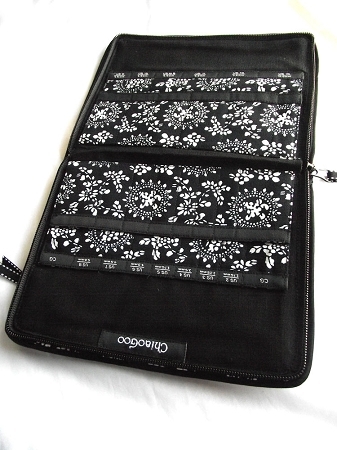 The ChiaoGoo interchangeable needle case is an elegant black and white case with a white ribbon. The case opens like a book and zips closed around the outside. 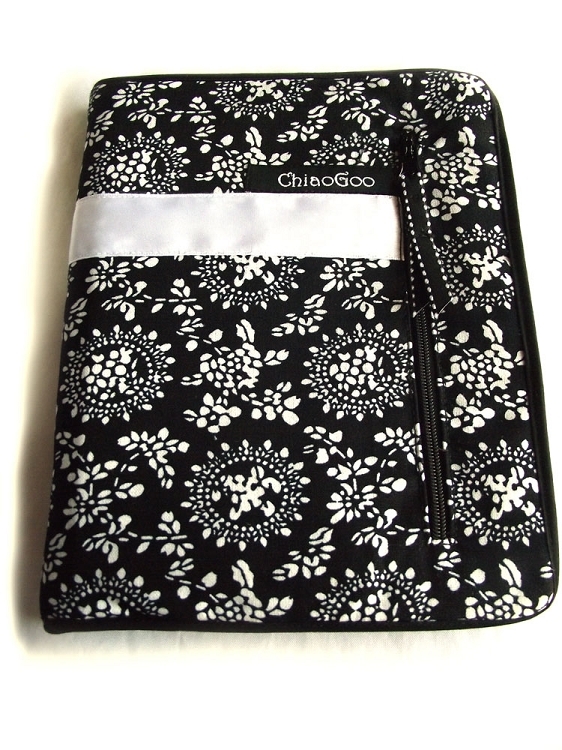 It is a compact size (6" x 8" closed) with 29 inner pockets for tips and one outside zippered pocket. This case arrived quickly, and its just beautiful. My mismatched collection of tips and cords fit great and I love that the pockets are marked with the size of the needles, very handy. I will be filling this quickly. I love things that are lovely to look at and lovely to use. This fits the bill! 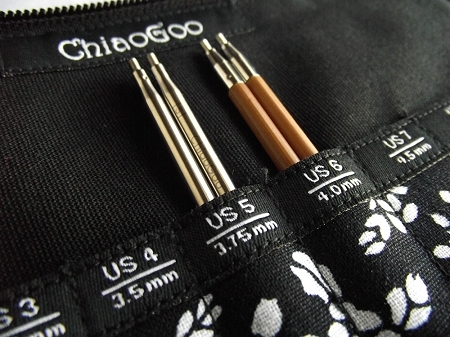 I ordered this case to store the flexible Chiaogoo Tunisian Crochet Hooks that I ordered from handsome fibres (they're awesome, in case someone is interested). The case is BEAUTIFUL and very very handy. I love it and it makes me feel good whenever I look at it. It has pockets for various sizes, so it's easier to store the items based on the size and it's easier to take them out quickly as well. The zipper on it is excellent, and very sturdy, as is the outer cloth, therefore, I think it will last a long time and would withstand the usual wear and tear that comes with opening and closing it regularly. The outside pocket is also handy for any notions that you might have lying around that you want stored. Don’t know why I waited so long to buy this for my IC needles. It’s perfect. The front zipper case is great for storage. I keep my cables in their respective bags so that the size and lengths are easy to find. As always, super fast shipping?? Q: I just bought the set of knitters pride dreamz normal length interchangeable needles. US Size 4-11 measure 4.5" tall and the 13-17 measure 5.25" tall. Will all these needles fit in this case? Q: Does this case have room for the cables or will it only hold the tips, and do you have to specify the size needles you have for it? A: This case has room for cables but does not have any special pockets for them. There is one zippered pocket on the front that cables or notions could be stored in. I personally store my own cables in baggies inside the main compartment. Q: Why so many pockets for tips? Does it have size-labels on all of them? Is it intended to hold all sizes of both lengths? Or both the metal and the bamboo tips? Or all of the above?